The American National Fire Protection Association (NFPA) recently hosted a 1.5 hour webinar for fire industry professionals and fire departments to provide a background, information and tools to help deal with unwanted alarms. Firewize has developed similar tools which we have been successfully using for many years. Send us a message via our contact form and we will send you a copy, and as a bonus, we will also send you a copy of our document "39 Hot Tips for eliminating unwanted alarms!" for FREE! By its very design a smoke detector is intended to detect the presence of contamination from airborne particles, typically smoke. 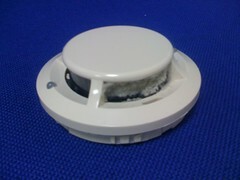 Unfortunately there are a great deal of other particles that when built up over time can adversely affect the performance of a smoke detector. Extending on from my recent blog on the Brisbane floods and the affect on fire & life safety, the uncanny summer weather in Melbourne has caused another problem. The weather in Melbourne this summer has been quite tropical with a weather pattern extending form Far-North-Queensland all the way down to Tasmania. This weather pattern has also led to a significant increase in the level of of relative humidity1 as reported by the Bureau of Meteorology. The relative humidity has been in excess of 85% for the period Jan 10 to Jan 13 which is significantly up on the average for this month to date, and the average over the past few years.